Problem Solving in Primary Mathematics: Learning to Investigate! Problem Solving in Primary Mathematics is an essential text designed to support new and experienced teachers in guiding pupils through mathematical investigations and problem solving, offering a framework that children themselves can begin to adopt as they progress to greater metacognitive awareness. 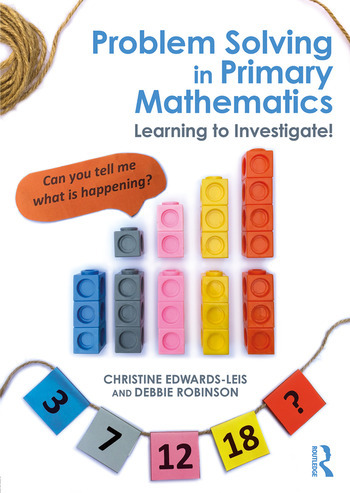 Aimed at new and experienced educators, particularly those with a maths specialism, and illustrated with investigations and activities, Problem Solving in Primary Mathematics demonstrates how frameworks can be used in key mathematical areas and assists students in progressing towards more meaningful problem solving. Christine Edwards-Leis is Senior Lecturer in Primary Mathematics at St Mary’s University, Twickenham, UK. Previously she was lecturer and researcher at University of South Australia, Australia. Her research interests are Mental Model Theory and how children use problem-solving strategies in mathematics and design and technology. Debbie Robinson is Head of Primary Mathematics and Senior Lecturer in Primary Mathematics at St Mary’s University, Twickenham, UK. She has extensive experience as both classroom teacher and advisory teacher in both primary and secondary schools. She provided INSET for qualified teachers for BEAM Publications and Education Authorities and her research interests are the use of practical activities, contexts and images to engage learners in mathematics.